Bits of My Own: The Red Thread is Connected! This is Connected, the twelfth and final design in The Red Thread. I finished this up on Friday. The two little snowmen (snow people) are now connected! I am still working out how to finish it. As soon as I do, I will post a picture. 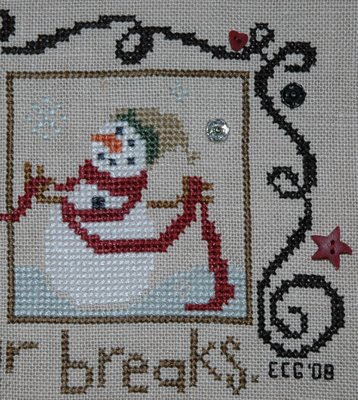 Well done on your latest finish, the whole piece looks lovely, the snowman is so cute! congrats on the finish. What an awesome piece. FANTASTIC - I have so enjoyed watching each of these little squares as you stitched them and now you have finished I shall quite miss them. Beautiful finish! I need to get back to mine...I've had some other things "jump" in front of this project! Applause, Applause for a great finish. It looks so great. That is quite an accomplishment.